Bedford, Mass. (May 10, 2016) -- Nothing ruins the joy of the great outdoors like mosquitos, black flies and other flying, biting insects. To solve this age-old problem, ScoutLook has joined forces with Thermacell Repellents, Inc., to launch the new Mosquito Alert tool in ScoutLook’s hunting and fishing apps. The Thermacell Mosquito Alert uses ScoutLook to accurately predict mosquito activity based on detailed weather conditions and mosquito biology. Users will be able to accurately assess bug levels and know when they are most likely to need their Thermacell in the field or on the water. 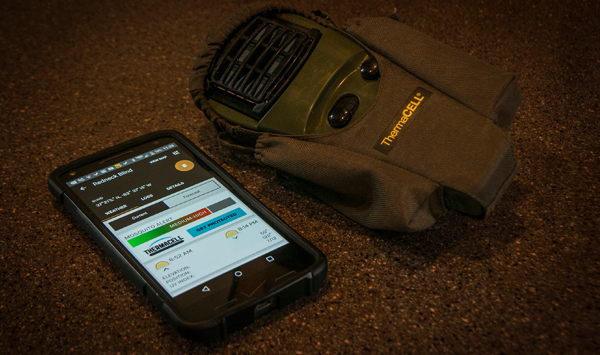 ScoutLook provides daily mosquito alerts side-by-side with weather forecasting, so users can best plan for the day’s adventures and determine where and when Thermacell units will be most necessary. Thermacell Repellents Inc, offers a breadth of products that protect against mosquitos and other biting insects in a 225 square foot area of protection. Thermacell Repellent lanterns and appliances are powered by a single butane cartridge. The heat generated by the butane cartridge vaporizes a small mat saturated with allethrin repellent, a copy of a repellent that naturally occurs in chrysanthemum flowers. For Spring 2016, Thermacell has launched the Scout Lantern and Max Life Mats which provide 12 hours of protection. The ScoutLook app with Mosquito Alert is now available for Android and coming soon for iOS. Thermacell Repellents, Inc., headquartered in Bedford, MA, designs, manufactures and markets area mosquito repellent solutions that create a 15 ft. x 15 ft zone of protection in minutes from mosquitoes, black flies and other flying insects. Thermacell products are lightweight, silent, and virtually odor free. Thermacell can be found at most outdoor, sporting goods, home improvement and mass merchant retailers in the US and l is also available internationally in more than 20 countries. For more information on Thermacell and its complete line of repellent products, consumer reviews, or store locations, visit www.Thermacell.com or call 1-866-753-3837.